The internationally bestselling fantasy sensation is back, with brand-new stories set in the world of Eragon and the Inheritance Cycle! A wanderer and a cursed child. Spells and magic. And dragons, of course. Welcome back to the world of Alagaësia. It's been a year since Eragon departed Alagaësia in search of the perfect home to train a new generation of Dragon Riders. Now he is struggling with an endless sea of tasks: constructing a vast dragonhold, wrangling with suppliers, guarding dragon eggs, and dealing with belligerent Urgals and haughty elves. Then a vision from the Eldunarí, unexpected visitors, and an exciting Urgal legend offer a much-needed distraction and a new perspective. 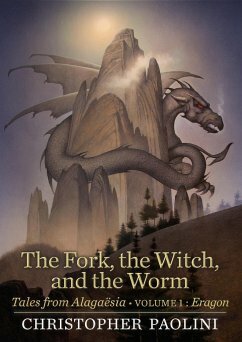 This volume features three original stories set in Alagaësia, interspersed with scenes from Eragon's own unfolding adventure. Included is an excerpt from the memoir of the unforgettable witch and fortune-teller Angela the herbalist . . . penned by Angela Paolini, the inspiration for the character, herself! Relish the incomparable imagination of Christopher Paolini in this thrilling new collection of stories based in the world of the Inheritance Cycle. Includes four new pieces of original art by the author.